Although that raises an interesting question. If something goes down 45%, is it a correction or a bear market? Most reasonable people would say that it was a bear market. Nobody should ride positions down 45%. That’s just bad discipline. And a lot of people who had discipline with gold believed in the mass monetization thesis, believed in the hyperinflationary endgame—which still might happen. But nobody should ride anything down 45%. Looking at this chart, you’d say that gold was in a bull market, right? 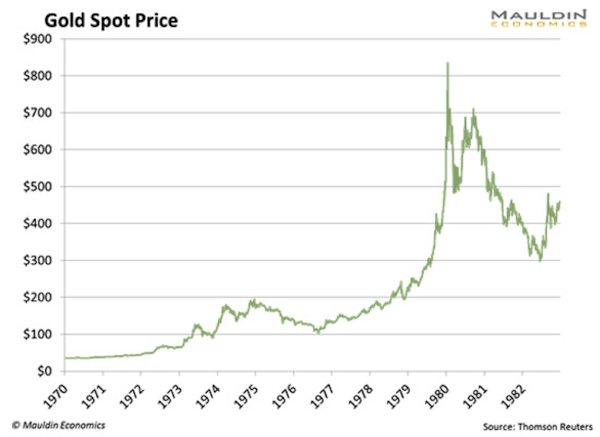 But look closely—during that time period, there was a 50% retracement, from about $200/ounce to $100/ounce. Based on technicals alone, if gold follows a similar pattern today (whereas we just had our 50% retracement), it could reach a high of $5,000 to $10,000 an ounce in a few years. The fundamental argument for gold is pretty strong these days. The alternative is a bunch of government bonds that yield nothing (or less than nothing) and that will probably never be repaid. Or stocks, which are currently expensive. Plus, there are indications that inflation is bottoming/has bottomed. All the stuff we have talked about before. Gold guys like to talk about the endgame. So let’s talk about the endgame. The US has a 103% debt-to-GDP ratio. It’ll go up a lot under either Trump or Clinton. Italy’s debt to GDP is about 170% or so. There really isn’t any chance that Japan is going to pay you back, or Italy, or even the US, once you take out-of-control entitlements into account. Nobody is going to default here. You want to talk about Financial Armageddon… that would be it. Greece hasn’t had a lot of luck with extending and pretending. They’re in this sort of endless depression. I doubt anyone would want to copy them. Nope, everyone is going to inflate, which is the stealth way to default. There has already been open discussion about helicopter money in Japan (essentially the BOJ retiring or canceling outstanding debt). This is where people just absolutely lose their minds. If I told a six-year-old that we were going to triple the amount of dollars/yen/euros in the system, they would tell you that prices would rise. More money chasing the same amount of goods. Somehow, when you get PhD economists thinking about this concept, they tell you that everything will be okay. I guess it is fine for Warren Buffett to eat like a six-year-old, but not for me to do economics like a six-year-old. We have sort of had this détente with the deficit under Obama—the Republican Congress has actually been a pretty effective opposition, and spending as a percentage of GDP has declined significantly since 2010. This is progress. But all of this will come to an end in November. The only candidate campaigning on a platform of deficit reduction is Gary Johnson. But nobody cares. Everyone cared about the deficit in 1992, when it wasn’t a big deal. Now that we have the highest debt levels since WWII, nobody cares. Gold cares very deeply about debt. Because once you get the debt up to unsustainable levels, it increases the likelihood that it will be directly monetized. That is all gold cares about. I deal with a lot of dumb questions about gold: “There is no inflation, why should I care about gold?” We will get inflation eventually—but that is not what gold cares about. Gold cares about you treating your currency like toilet paper. But you say these sorts of things in public and you’re a crank. The reality is that gold is a very technical trade. There were lots of reasons to be bullish on gold from 2011–2016, and it went down anyway. Nothing has really changed (except maybe the proliferation of negative interest rates). Japan, Italy, and the US are as insolvent as they ever were. Except now the chart is making higher highs and higher lows. I don’t care what you think about gold—if you don’t respect the chart now, you are as big of a moron as I was for riding it all the way down. I’m long in a variety of forms, and I’m staying long until further notice. Click here to subscribe to Jared’s free weekly newsletter, The 10th Man, so you won’t fall prey to the herd mentality that so often causes mainstream investors to make the wrong decision.